SP Digital is a computer company, founded in Santiago de Chile, in 2006. What was born as a small family business, over time has grown to become a benchmark for e-commerce in Chile. Its online store offers a vast catalog of categories of computer products and it receives more than 700K visits per month, according to SimilarWeb. They constantly look for ways to innovate and satisfy the unique client experience and, due to this fact, they have huge brand loyalty. SP Digital was searching for a solution aimed at creating a highly differentiated experience, providing better customer satisfaction and increasing online sales. At the same time, they were looking for an effective and easy to implement tool, without the constant need for IT assistance. For this, they collaborated with Retail Rocket to launch a personalized online shopping experience. The Retail Rocket platform analyzes the behavior of online users and adjusts the website in real time, so that each user gets their own version of the online store, highlighting the products that are more likely to buy, depending on their preferences and purchase history. The platform offers more than 20 customization scenarios for each step of the customer’s journey. In this case study, we will analyze the results obtained by adding the Retail Rocket personalised product recommendations on the homepage and cart page, at Spdigital.cl. online store. An A/B test was conducted to determine the efficiency of the Retail Rocket product recommendation tool in increasing the conversion rate on different pages within the website. The objective of the test was to identify statistically significant difference in the conversion rate between the visitor segments. 2. The second visitor segment: Most popular products from categories that visitors are currently interested in. According to the data of the A/B test, the use of the mechanics «Most popular products from categories that visitors are currently interested in» in the recommendations block on the homepage of the online store Spdigital.cl increases the conversion of target visitors of 3,2%. The goal of the experiment was to identify statistically significant difference in the conversion rate between the visitor segments. According to the data of the A/B test, the use of the recommendations block «Related products, personalized based on visitor’s interests to products’ properties (prices, brands etc. )» on the cart page of the online store Spdigital.cl increases the conversion by 12.1%. It is important to impact users with the appropriate recommendation blocks on each page of the online store to maximize its effect. Customizing our website by using A/B testing tools will result in a personalized shopping experience for each user according to their interests. This will result in an increase of the effectiveness of our strategy as well. 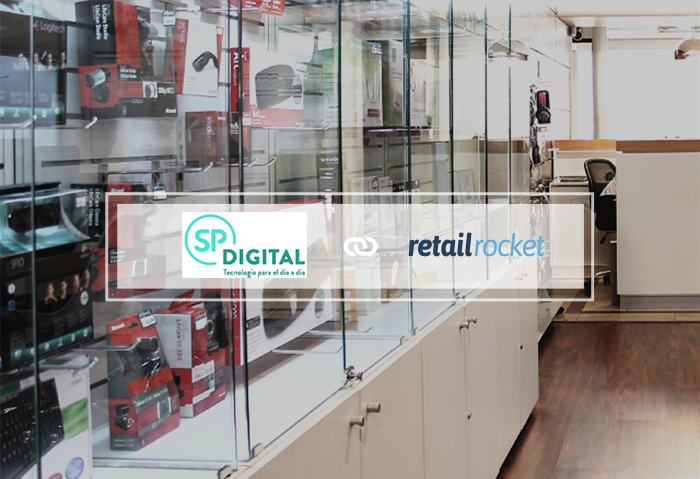 Retail Rocket helped Spdigital.cl to configure the most efficient self-learning algorithm based on big data analysis in real time, without the need for IT resources and without a long implementation period. When adding product recommendations, the A/B tests showed a conversion increase on the homepage of 3.2% and 12.1% on the cart page. Thanks to these results, SP Digital and Retail Rocket will continue collaborating to improve the usability of their online store and achieve a unique customer experience.